The past holds many secrets...Can you uncover the secret of the Qin dynasty? 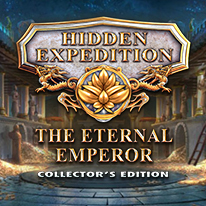 Enjoy the next installment of the Hidden Expedition series! You’ve been called to China to help in the excavation of the ancient Emperor Qin’s final resting place. What starts as a simple mission quickly turns into the experience of a lifetime when your colleague’s lives are put in danger. Can you uncover the secrets of the Qin dynasty and save your friends before your time runs out? Find out in this astonishing hidden-object puzzle adventure! - Investigate an ancient Chinese mystery and help save modern-day China! - Unlock bonus challenges and re-play puzzles and mini-games. - Collect souvenirs, fact cards, morphing objects, and more! - Remember your journey with videos, soundtrack, and wallpapers. - Never get lost with the helpful strategy guide.